Staff were outstanding and airport is lovely. Check in was easy and all staff were happy at 5am. Where to find St Ignace hotels near an airport? Where can I find hotels in St Ignace that are near tourist attractions? If you're searching for comfortable hotels in or around St Ignace, it's comforting to know that there are numerous different possibilities. Spend some time checking out our 31 accommodation options, which are all within a 0.1-kilometre (0.06-mile) radius of St Ignace's city center. Canny travelers who fully appreciate the many benefits of booking accommodation in the heart of town should check out the Best Western Harbour Pointe Lakefront and St. Ignace Budget Host Inn, which are located within 1 kilometre (0.6 miles) of St Ignace's center. Cheaper accommodations within the St Ignace region include the Voyager Inn, Baymont Inn & Suites St. Ignace Lakefront and K Royale Lakefront Inn. 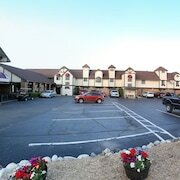 The Hotel Iroquois is 9 kilometres (5 miles) from the central part of St Ignace. Alternatively, the Island House Hotel is situated 9 kilometres (6 miles) away. Alternatively, make a booking at the Lake View Hotel or the The Inn At Stonecliffe. Looking for things to do? Consider spending a day or two exploring Mackinac Bridge and Old Mackinac Point Lighthouse, which you'll find in Mackinaw City, 10 kilometres (6 miles) to the south of St Ignace. 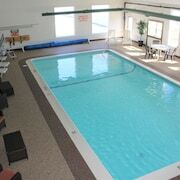 The Mackinaw Beach & Bay Inn & Suites and Crown Choice Inn & Suites Lakeview & Waterpark are a few of the accommodation options in Mackinaw City. Or stay in Cheboygan, 30 kilometres (20 miles) to the southeast of St Ignace, where you can choose from the Best Western River Terrace and Continental Inn. If you stay in Cheboygan, a couple of sights worth adding to your itinerary are the Cheboygan State Park and Cheboygan Opera House. Consider spending an afternoon hanging out with Straits of Mackinac sports fans at a local match. Otsego County Sportsplex is 95 kilometres (59 miles) to the south of St Ignace. Book a hotel close to the action at the Holiday Inn Express Gaylord or the Hampton Inn Gaylord. Planning a trip to St Ignace? Your most convenient airport will be Pellston Regional Airport, 35 kilometres (21 miles) from St Ignace. 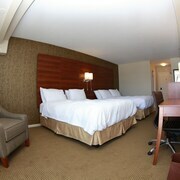 Book a room nearby at the Pellston Lodge Magnuson Hotel. 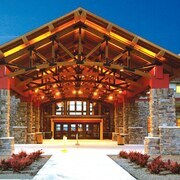 What are the most popular St Ignace hotels? Are there hotels in other cities near St Ignace? 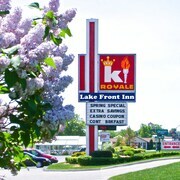 What other types of accommodations are available in St Ignace? Explore St Ignace with Expedia.ca’s Travel Guides to find the best flights, cars, holiday packages and more!